Our next planned visit was the memorial village at Oradour-sur-Glane. This was a 480km journey, much more than I would ever travel in a day. Our Mercedes 814 lorry conversion has a six cylinder 6 litre engine….. with no turbo, so it is not going to win any races. These Mercedes engines though are world renowned and it will always get you to where you want to go…. eventually. I try to drive around 150km per day maximum, more if I am in a particular rush to get somewhere, but we are in no hurry. On the way to we had 3 overnight stops, with the last stop just 40km from Oradour. This way we could arrive early the next day and spend much of the day at the memorial village. On the journey down, we stayed at our first CampingCarPark aire. CampingCarPark is a fairly new company which have been taking over a network of aires throughout France as well as building some new ones. When you arrive at your first CCP aire, you have to buy a “membership” card. They are dispensed at the automatic entrance machines of all their aires and cost €4. They can then be loaded with money like a pre-paid credit card and you then use this card to pay for each of the company’s aires you stay at. Each aire is fully automated. You scan your CCP card which opens the barrier to let you enter. There is normally a maximum of 3 days stay at each location and your pre-paid card is debited when you exit the aire, so you need to have sufficient credit before you leave. The barrier will open to let you in without having any credit and you can top up your card online or at any of the automated machines at the entrance. Fees range from €8 to €12 per night depending on location, time of year and tourist tax. All their aires have electric hook up and free WiFi. When we arrived at our second CCP aire at Moulismes it was empty. We scanned our card but the barrier would not open. We didn’t have any credit on our card so we topped it up thinking this may be the reason, but still no luck trying to get the barrier to open. We telephoned their helpline number displayed at every location and a gentleman answered who spoke perfect English. After checking our new membership number from the card he was able to say where we had stayed before and confirmed that we had just topped up our card at this location. He talked us through a procedure but still no luck with the barrier opening. “Not to worry” he said, “I will open it for you.” I assume the barriers are operated by a SIM card and a minute later he was able to open it remotely and wished us a pleasant stay. Excellent customer service and I would highly rate their aires. This aire had a capacity of more than 60 vans and that night we had it all to ourselves, so we enjoyed the fast WiFi without the need to share! After leaving the aire at Moulismes we made the short journey to Oradour-Sur-Glane. Here there is a large free aire running around the edge of a park. The spaces are large and we had no problem fitting in our 9m motorhome. We settled in with a quick cup of tea then headed off to see the memorial village, about a 20 minute walk from the aire. Oradour-sur-Glane was a sleepy French village set in glorious countryside and was actually a popular holiday location lying on the tram route between Limoges and Saint Julian. On 10 June 1944 it was going about its usual Saturday business. Even though it was a small village, its population had been swollen with refugees from Alsace, some holiday makers and the fact that Saturday was tobacco distribution day, so people had arrived from the surrounding areas to collect their tobacco. Oradour-sur-Glane was in a region of France not controlled by the German occupation and had some autonomy for running its own affairs, which was allowed by the Reich in Berlin, so it did not have much contact with the German army. Suddenly a group of 200 SS-Waffen soldiers rolled into the village. They ordered everyone in the village to gather at the fairground with their papers. Here they separated the women and children and marched them down to the church. The men were distributed in groups in various barns located around the village and then the soldiers systematically went from barn to barn shooting them with machine guns. Most were killed instantly whilst others were seriously injured. The SS soldiers then set fire to the buildings were they had shot the men, incinerating all the bodies, both dead and alive. They then turned their attention to the church where the women and children were being held captive. They detonated choking smoke bombs. Anyone who tried to escape were mowed down by machine gun fire. Finally they set fire to the church killing everyone within it. After this they razed the entire village. A lucky few fearing that something was not right when the SS-Waffen arrived, hid then clambered over the fields to escape the horror. Of those that remained in the village, the SS killed 642 civilians… 197 men, 240 women and 205 children. There were only 3 survivors of the atrocity. After the SS soldiers left the village and the alarm was raised, people arrived from the surrounding areas to witness the devastation. Most of the victims had been so badly burned and cremated that only 10% of them could be officially identified. It was decided that the village should be left as it was found on that day as an everlasting memorial to the martyrs of Oradour-sur-Glane. Today, the memorial village is surrounded by a wall and can only be entered through a visitor centre which has a tunnel running under the main road. A new village has been built around the outskirts of the original. In the visitor centre itself there is a paid museum, but it was closed on the day of our visit. Entrance t the memorial village itself is free. As you walk through the tunnel there are 642 white tiles with photographs of the victims. Where they have not been able to source a photograph, the tile is left blank. When you exit the tunnel you walk up an original short street but even in the first group of buildings, there was a barn where many of the village men were killed. At the end of this street you enter what was the main thoroughfare of Oradour. It is here that you get the first visual impact of the scale of the devastation as you look down the long street. Turning left you can walk to what was the head of the village. Ironically at the very top of the village you can still see the old monumental sculptor’s property with unfinished headstones on display. The main entrance to the village was a broad tree lined avenue with views over the surrounding countryside. This is where the trams entered from St. Julian and the tram station is located in this section along with the mayor’s residence, post office and boy’s school. As you walk down the main street you see the charred remnants of the village, both houses and businesses. On the right there is the tall entrance of one of the town’s garages, complete with signs. The body of the owner of the garage was found a couple of hundred yards away near the bottom of the village. You then approach a junction which leads up to the fairground where the villagers were gathered. At this junction sits a car which is probably the most photographed part of the village. The car belonged to the town’s doctor Jean Desourteaux, who was also the mayor, and it was he who the SS officers ordered to gather everyone in the fairground. All the other cars in the village had been parked in garages or behind buildings as petrol was so highly rationed during the war. The doctor had special exemption to the availability of petrol so that he could visit his patients. As you walk up into what was the old fairground area, there has been an underground museum built which houses artifacts recovered from the village after the atrocity. Everyday items like spectacles and children’s toys are stored in glass cabinets. Behind this lies the original town cemetery. Those victims that could be identified were buried in existing family graves while the rest of the bodies were buried in a mass grave at the rear of the cemetery. A memorial was built here to the victims consisting of an obelisk, surrounded by walls listing the names of all the dead. Under the obelisk are 2 coffins with glass lids which contain the charred bones of some of the victims. After exiting the cemetery taking the street from the bottom of the fairground area, takes you towards the bottom of the village where the church was located. The shell of the church still stands with the original crucifix outside. Walking into the church is a very eerie feeling knowing how many were killed within its walls. The stone altar still stands at the head of the church. One of the survivors had climbed on the altar and out through one of the windows only to have been shot by the SS machine gunners. She was badly injured and played dead, but survived the shooting. Strangely, the confessional box was undamaged in the fire and a group of young boys bodies was discovered inside it here they had tried to hide. Ironically on the inside wall of the church is a memorial to the dead of the First World War 1914-1918 from this area. As you come out of the church and walk back up the hill through the main street you can see the tramlines and overhead power cables still intact. Inside many of the buildings can be seen the remnants of the destruction. Sewing machines, bicycles, cooking pots and various vehicles scattered around the village parked up not having been used. You can see all the bread ovens at the back of the town’s boulangerie. All the roofs have been burned to the ground and the surviving walls of the buildings are still charred black from the fire which destroyed it. Reading the historical background to the atrocity, there are conflicting stories as to why this actually happened. Like any historical event, there will be differing versions of what took place. Researchers have uncovered documentary evidence contradicting the official French version presented at the museum which has been taken to the authorities who run the museum. They immediately dismissed this evidence in favour of their own version, without trying to further verify the facts. This is because there was reference to the actions of the French Resistance which they don’t wish to admit. An excellent resource exists at In A Ruined State, which goes into the following version in immense detail. With this area of France having been given autonomy for the majority of its affairs by the Reich, there were strong pockets of French Resistance scattered around it. There were also many French who had joined a police called the Milice which supported the Nazis and fed them information about the Resistance. The day before the horror, an SS officer had been kidnapped by the French Resistance. Although there was no known Resistance in Oradour-sur-Glane, there was a strong presence in a village 30km away called Oradour-sur-Vayres. It is believed the SS Officer was being held there and that a Milice informant had told the SS of this but had mixed it up with Oradour-sur-Glane. 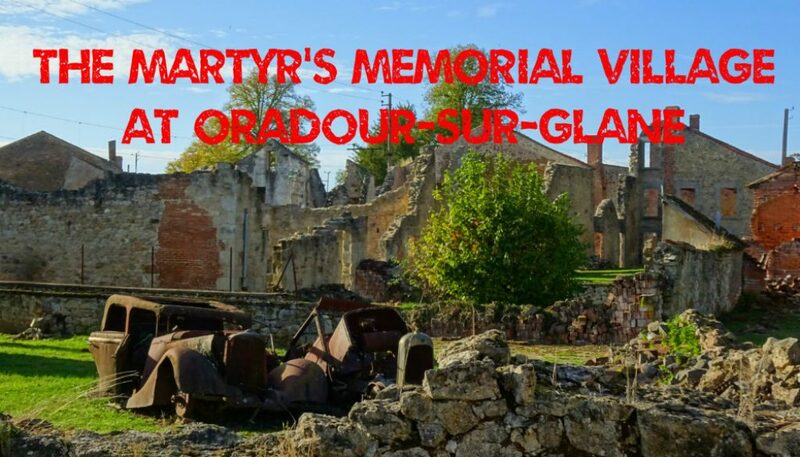 As well as the similarity in name, Oradour-sur-Vayres was of a similar layout to Oradour-sur-Glane with the church at the bottom of the village near the river and a wide main street leading up from the church. It may be that the informant had told the SS of Oradour-sur-Vayres and described its layout but that the arrival of the SS in Oradour-sur-Glane was simply a case of mistaken identity. Thinking that the village was a stronghold for French Resistance and trying to locate the kidnapped SS officer, everyone in the town was rounded up, and eventually killed in retribution for the kidnap. In the end the French Resistance never disclosed what had happened to the kidnapped SS officer. No-one was ever really brought to justice over what happened in Oradour-sur-Glane. Afterwards the SS unit was moved north to the Normandy beaches where many of them, including the officer who had led the attack, were killed. A trial was held in Bordeaux in 1953 for those soldiers they were able to locate, but by 1958 they had all been pardoned (including 2 that had been sentenced to death) and released from prison. Walking through the whole village is a very thought provoking experience, knowing the horror that occurred there. Probably the most eerie feeling of all was that inside the memorial village itself, even though many of the streets are still tree lined, you cannot hear the sound of any birds. As soon as you exit the memorial village back through the visitor centre into the new village, birds can be heard chirping all around you. Perhaps they too know of the dark history of this place.